On Dec. 24, 1968, NASA astronauts took this stunning photo of Earth rising from lunar orbit during the Apollo 8 mission. 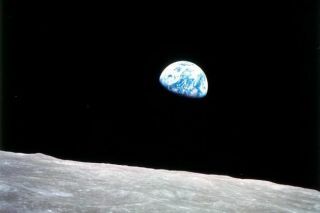 This photo, named "Earthrise," was the driving inspiration for a new short documentary with the same name. The documentary features imagery from the mission alongside in-depth video interviews with the Apollo 8 astronauts themselves. NEW YORK — The astronauts of Apollo 8, a mission often overlooked by popular media, were the first humans to capture an image of Earth from space. "Earthrise," a new, award-winning short documentary named after the famous photo, centers on the image and the remarkable story behind it. Astronauts experience what author Frank White first dubbed "the overview effect" — a psychological effect that occurs when seeing the Earth from a distant vantage point (space) shifts a person's perspective. "Earthrise" director Emmanuel Vaughan-Lee interviewed Apollo 8 astronauts Frank Borman, Jim Lovell and William Anders to uncover what the historic mission and moment were really like. "For me, I think it's a pretty simple film with a simple message," Vaughan-Lee told Space.com at the screening. "The Earth is an incredibly beautiful, fragile planet. You know that's what they experienced — that's what they shared," he said, referring to the Apollo 8 astronauts. It might be an impossible task to instill the overview effect in members of an audience who have never been to space and seen the blue marble we call home from such a distance. But Vaughan-Lee hopes to create, with this film, "a love letter to the Earth that was an accurate representation of what they [the astronauts] experienced when they left and when they're coming towards it … there's a feeling of reverence and a feeling of respect towards what is most fundamental, which is this planet." Vaughan-Lee said he hopes to "get to the simple core of remembering how precious and beautiful this planet is." Aside from conveying the spectacular, almost indescribable experience of viewing Earth from space, "Earthrise" also aims to shine a light on what the Apollo 8 mission was really like. With the help of "space junkies," as Vaughan-Lee described them when speaking to Space.com, he was able to get his hands on photographs from the mission that few had seen before. Some of the photos might have been out of focus or had a finger in the way of the lens, but Vaughan-Lee said that, regardless, the photos revealed a hidden beauty to the mission which inspired him. In "Earthrise," Vaughan-Lee doesn't just show launch footage or formal interviews with the astronauts from that time. He also shows the astronauts' "home movies" from aboard the spacecraft and makes their story easily relatable, even though it took place many decades ago. This film, which also features a breathtaking score, captures the very human story behind the Apollo 8 mission and one of the most reproduced photos in history. "Earthrise" premiered at the Tribeca Film Festival and won AFI Docs' Audience Award for Best Short. The film will be available Nov. 19 on POV Shorts and available for streaming on pov.org. Following this release, "Earthrise" will be available on NYTimes.com through The New York Times Op-Docs series. Editor's Note: This article was updated to clarify that Earthrise was the first photo taken by human astronauts of the planet from space.